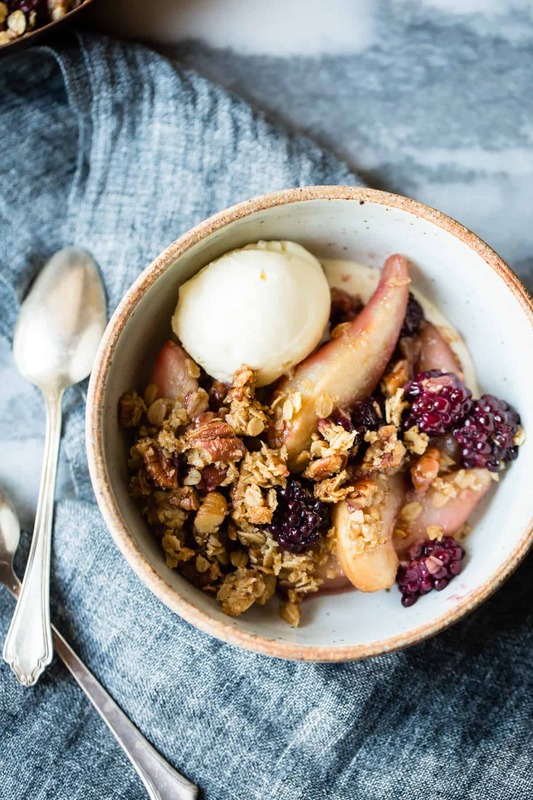 A super-simple fruit crisp recipe made with rolled oats, pecans, and maple-syrup that’s naturally gluten-free and kissed with the zing of fresh ginger. Adapted from Gluten-Free for Good by Samantha Seneviratne. 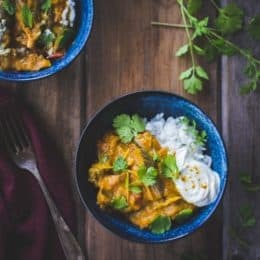 This recipe comes from a beautiful new book by one of my favorite authors Sam Seneviratne. Sam wrote and styled The New Sugar and Spice, from whence came these delectable flans. She also contributes recipes to The New York Times (which are crazy good and which Sarah and I have had the pleasure of styling!) 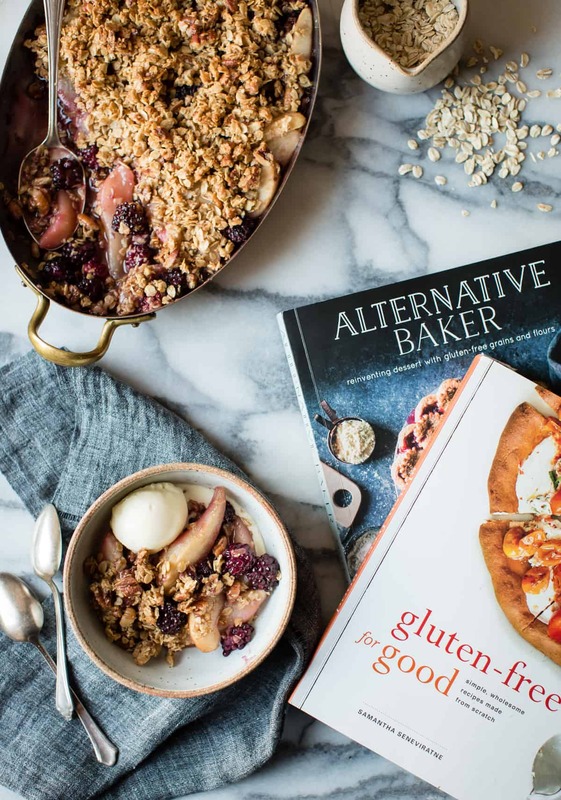 Her new book Gluten-Free for Good: Simple, Wholesome Recipes Made from Scratch is a total gem. 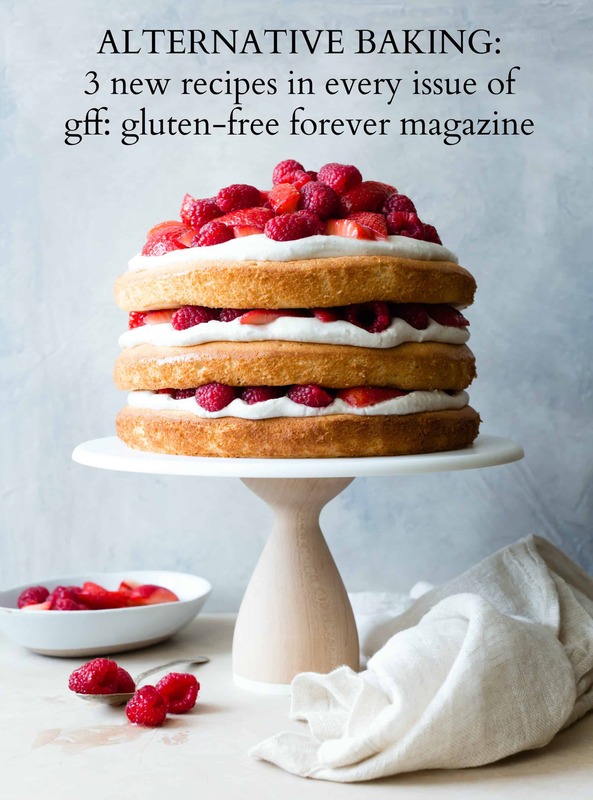 And we’re giving away copies of Gluten-Free for Good and Alternative Baker today! See below for details. But first, a wee rant. I wanted to grab that reviewer by his ignorant shoulders and scream “Polenta IS a dry ingredient, you moron! Only an idiot would buy precooked polenta in a tube to put in a cake when it was clearly listed as a dry ingredient. The book is fine – you’re the one who stinks!” The fact that the review remained up, tarnishing the rating of the book, seemed a gross injustice. I realized then that, should I ever be fortunate enough to publish my own book, I’d need to toughen up and be ready for annoying Amazon reviews (and take up kickboxing to get out my aggression, clearly). “Don’t read the Amazon reviews,” more than one cookbook author warned me. But did I listen? 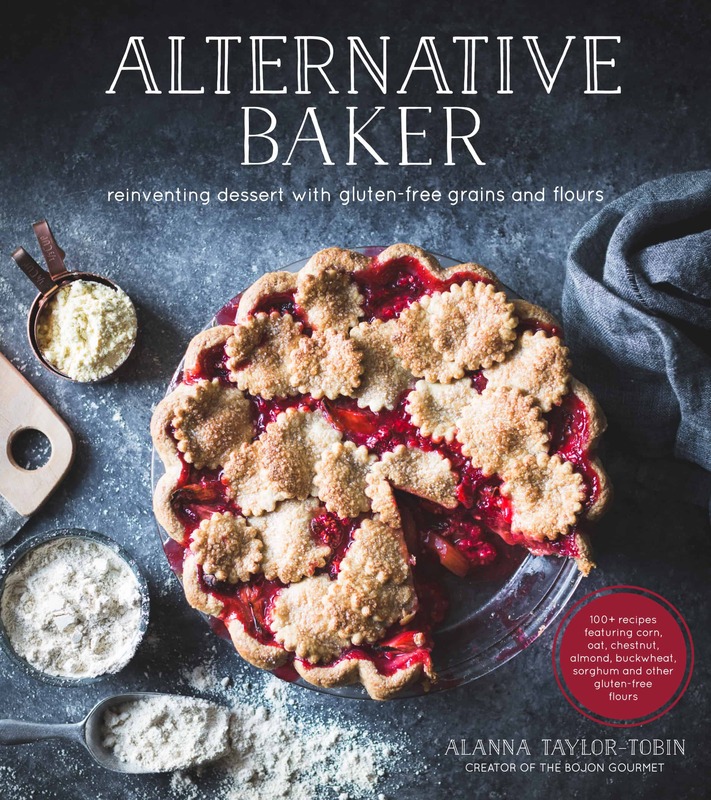 I was thrilled to get my first positive reviews, calling Alternative Baker “My Baking Bible,” “utterly gorgeous” and full of “jaw-dropping photographs, meticulously crafted recipes, easy-to-follow instructions, and tasty results.” I was thrilled! Maybe I would manage to dodge psycho reviewers after all. Alas, I was as naive as an inexperienced baker buying polenta for the first time. The first annoying review came in the other day, complete with 3 stars. “I guess there wasn’t enough info when I ordered this. It seems every recipe I have looked at uses dairy. It’s just Gluten free. Bummer, I will have to give it away.” I found this incredibly frustrating because 1) there are several recipes in the book that are dairy-free, including 4 that are completely vegan, and vegan crust options for both the pie and tart sections that make it easy to convert those recipes to being dairy-free, and 2) nowhere does the book claim to be dairy-free, so there was no need for the reviewer to slam my book for their own mistake in purchasing a book that didn’t meet their dietary needs. I took some deep breaths, visualized floating down a quiet stream with the breeze in my hair and no pesky vegans, then wrote a (hopefully) calm and kind note back to the reviewer letting them know about the dairy-free recipes in the book, and explaining my rationale for including dairy in the recipes. Since the book already asks for 14 different flours, and many recipes are made with highly seasonal fruit, I wanted to keep the other ingredients as accessible and familiar as possible. I was also careful to keep plenty of nut-free options in the book, since many GF baking books use a lot of almond flour that can be difficult to substitute out for allergies, and I even included some naturally-sweetened recipes. Speaking of books that are gluten-free but full of (some) delicious dairy, I’m currently obsessed with Gluten-Free for Good by Samantha Seneviratne. Like me, Sam isn’t 100% gluten-free, but her love of cooking and baking for everyone she knows drove her to rock some deliriously good GF recipes. The book is filled with stunning photos and streamlined, everyday fare, from breakfast through to dessert, all loaded with vibrant colors and flavors. 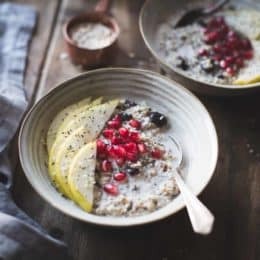 Sam’s baking recipes all use alternative grains and flours rather than relying on pre-fab baking mixes, and most recipes are free from gums as well, using psyllium powder instead. The book is mostly vegetarian, and it even has some dairy-free and vegan options. Paging through the book makes we want to run to the kitchen and cook every time I open it up. Which is a lot. 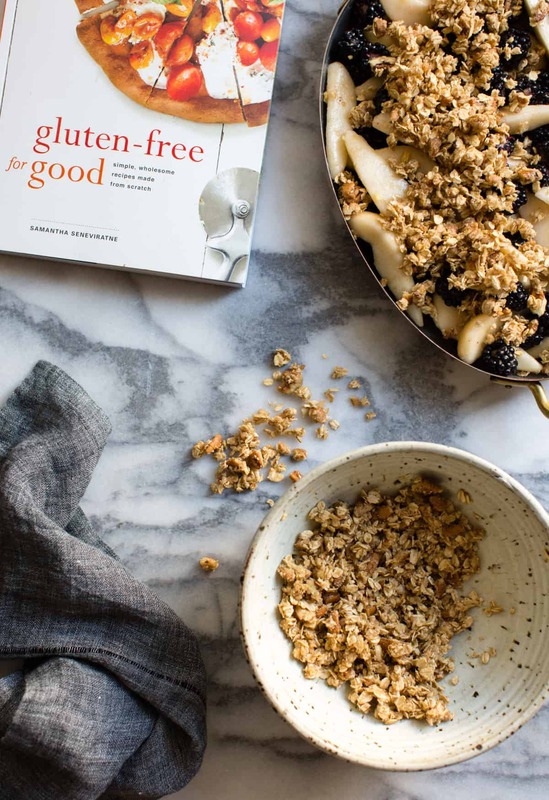 Sam’s Pear and Ginger Crisp exemplifies the recipes in GF for Good, with easy-to-source ingredients, a seasonal fruit base, streamlined instructions, and clean flavors. I added blackberries this time around, but the recipe is just as good without (and I bet pomegranate, cranberries, or poached quince could be tasty, as well). A dose of fresh ginger adds zing and acidity to the filling – just pears, maple syrup, and a little cornstarch. 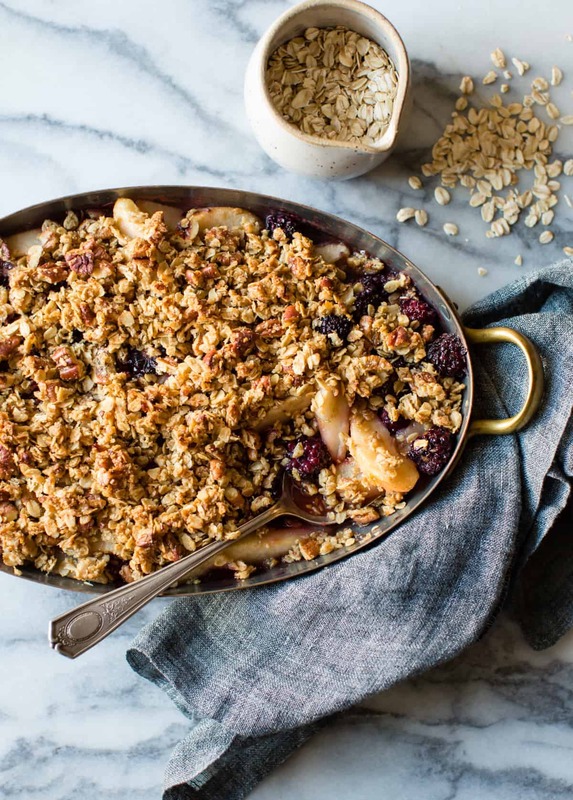 The topping is simply oats, nuts, brown sugar, butter, and just the right level of salt, and it bakes up into a topping that reminds me a bit of tender, clustery granola. In fact, this crisp works as well for breakfast with plain yogurt as it does for dessert with ice cream. I’m especially glad to have this recipe in my arsenal for when I don’t have a pantry full of alternative flours at hand. and loads more. Gluten-Free for Good gets five stars from this reviewer! THE GIVEAWAY IS NOW CLOSED: We’re giving away a copy of Gluten-Free for Good and Alternative Baker to one lucky winner! TO ENTER: Leave a comment below about your favorite seasonal fruit dessert OR a recipe you’d like to find a good gluten-free version of. THE DETAILS: Open to residents in the U.S. and Canada. Giveaway will run from Thursday, October 12th through Wednesday, October 19th, 2016. Winners will be notified by email by Sunday, October 23rd. 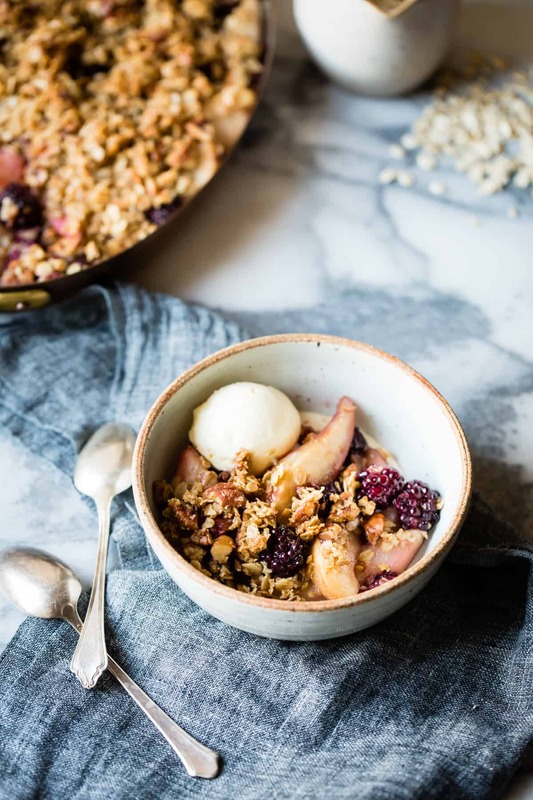 A stunningly simple fruit crisp with a granola-like topping that's naturally gluten-free, all kissed with the zing of fresh ginger. Adapted from Gluten-Free for Good by Samantha Seneviratne. Position a rack in the lower third of the oven and preheat to 350ºF. 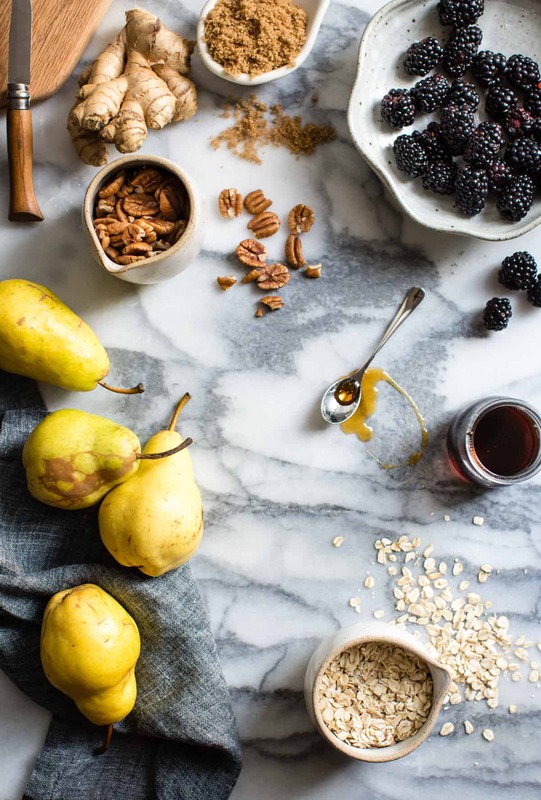 In a large bowl, toss together the pears, blackberries, maple syrup, ginger, and cornstarch until well-combined. Scrape into an 8x8” pan or the equivalent. In another large bowl, combine the oats, pecans, brown sugar, salt, and butter, rubbing the butter with your fingers until the mixture forms large clumps. Sprinkle the topping over the fruit. Bake the crisp until the top is deeply golden and the fruit is bubbling, 35-45 minutes. Let cool slightly, then serve warm, with a scoop of ice cream if you like. My favorite seasonal fruit dessert is…oh my – how can I choose just one? Right now I’m crushing pretty hard on poached pears in any and everything. PS. This crisp is gorgeous and I’ll eat this to satisfy my craving. Kthnx. My favorite fruit dessert is rubarb and strawberries. This is wonderful cooked together. My Granny used to make peach hand pies. I resently discovered white peaches. I think that they would be wonderful in a cream cheese pie crust with a thick and spiced filling. Totally! I have a couple recipes in my book – a pear pomegranate clafoutis, and an apple cranberry pomegranate crisp! I love apple + plum + ginger! Beautiful with the addition of the blackberries, and it is my pet peeve when reviewers blame the recipe for their own errors or substitutions. I am looking for a great GF birthday cake. I love apple cranberry crisps! The sweet and tart together is so delicious, and definitely counts as a good breakfast too in my mind! ;) I would love to win – thanks for the chance! Oh man, crumbles are my favorite! But I actually haven’t successfully made one…ever… Because my mom’s much made crumble has no recipe. So thanks for this! Lately, on the gluten-free baking front, I’ve been dithering with hermit bars and vegan cinnamon rolls. My kids love gluten free apple and raspberry and pear crisps. I’m in a desperate search for a gluten free challah! Help! Yikes, GF challah would be so tricky!! Do I really have to pick just one favorite seasonal fruit recipe? I absolutely love rhubarb and have made your rhubarb roulade more times than I can count. It is amazing!! And…. if you could come up with a fabulous alternative grain croissant recipe I would be your forever friend! This is a book looks absolutely fabulous! What a fabulous recipe and giveaway, Alanna! This crisp is over the top delicious and I love the pecans in the topping. The critics.. they’re always out there, right? And we’ll never be able to please everyone, no matter what. I’ve had your book in my hands for three weeks now. It’s dog eared, tagged and already spilt on! I’ve been to three different stores in search of alternative grains and have purchased sweet rice flour, tapioca starch, a new bag of buckwheat, teff and amaranth. I can’t wait to make your Banana Caramel Cream Tart and Bourbon Sweet Potato Cheese Cake! Your Teff Oatmeal Cookies with Whiskey Currants got rave reviews from friends and family. I’m inspired and so excited to try some of these new-to-me grains. You’ve taken the bull by the horns (as we say in TX) and have led us down the path of discovery, rejuvenating ancient grains! I don’t see your book as a GF book, necessarily. I see it as a modern take on grains and flours once forgotten. It’s a work of art, Alanna. Thank you for inspiring me and so many others! Now… a favorite fruit? It’s gotta be blueberries.. in any form. Raw, easy to bake with, toss in sangria… Dessert? Probably pots de creme.. or a blueberry crisp :D .
I had a wonderful apple pie recently with fresh fall apples. Made me so happy! I also love simply eating handfuls of blueberries and raspberries for dessert wrench they are in season. I can’t get enough! I was daydreaming about a possible crisp recipe earlier this week and then this email came in today! It must be fate. Will have to make this on the weekend. They are perfect fall flavours and we’ve been eating ginger in everything lately, it’s our favourite right now. 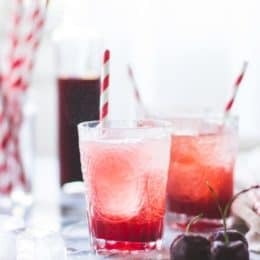 I just have a quick question – could I use frozen (thawed?) wild blueberries? I understand the colour might bleed through, but I really wouldn’t mind! And so sorry about the comments section – they really can be disheartening. But pay no attention – your recipes are truly magical and your book is going to make SO many people happy and grateful!! As for a dessert that I would LOVE to see a delicious GF, refined sugar-free version of is Pineapple Upside Down Cake!! You’re so sweet Vittoria – thanks for the kind words! I think frozen wild blueberries would be perfect in place of the blackberries – probably no need to thaw. Let me know if you give it a go! Thank you! So excited to try this crisp! Every fall my mom makes a sublime apple cake with penuche icing from the apples on her trees in her backyard, and even though I’ve long moved away from home I still find myself CRAVING that dessert whenever the leaves start to change. Speaking of… is there a good GF apple cake recipe that exists?? Rhubarb anything, preferably without strawberries though! 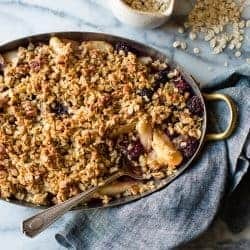 I would love a good crumble or granola recipe with no oats! 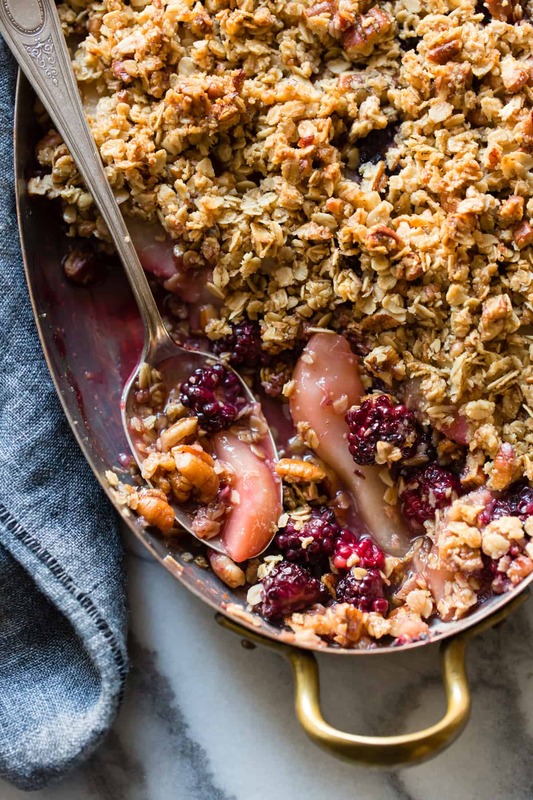 This pear crumble looks delicious. I have some bosc pears now and I am going to give it a try. Earlier in the month I was making an Italian plum torte from NY Times which wasn’t gluten-free but so good. It’s the one from Marian Burros. I would love to bake it gluten-free. Btw, Amazon reviews are – sometimes – the worst. I read the “bad” review on your book and I thought WHAAAAT? Do you know what gluten-free means? And dairy is maybe the easiest thing to replace in a recipe anyway. Your book is stunning, f**k the morons. Oh Amazon reviews. One of my favorite vegetarian cookbook has quite a few one star reviews on Amazon because it’s not vegan. I’m sorry that you have some special people using your cookbook. Maybe it’s a rite of passage to “real authorial status”? This crisp looks fantastic. I’m not gluten free, but I loved The New Sugar and Spice, so I’ll definitely have to check out GF for Good. As for my favorite seasonal fruit dessert, I’m going to have to go with my mom’s apple betty. It’s simple and nostalgic as all get out, but it’s so deeply satisfying in a way I can’t describe. Omg, that poor vegetarian cookbook. Argh! 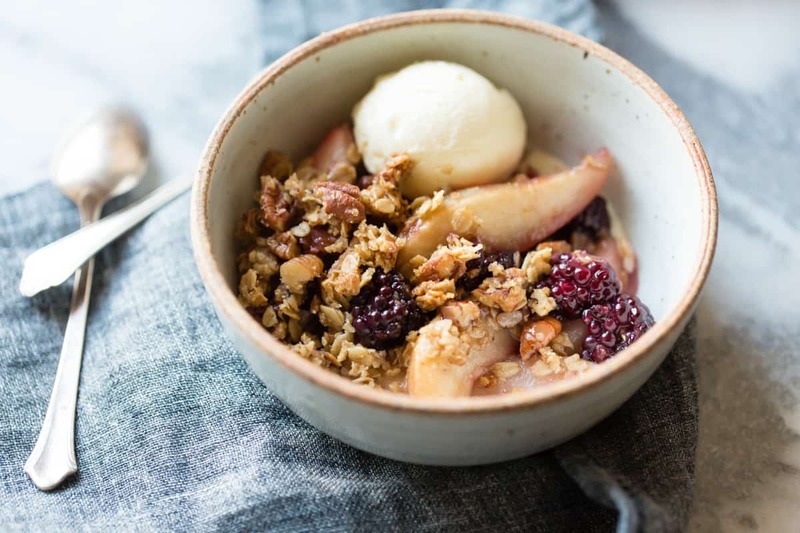 And mmm brown betty – that’s one dessert I have yet to try! My favorite seasonal dessert is a pumpkin pie. It encompasses my favorite season…fall and my favorite holiday…Thanksgiving. I’m a “newbie” to your site and love it! 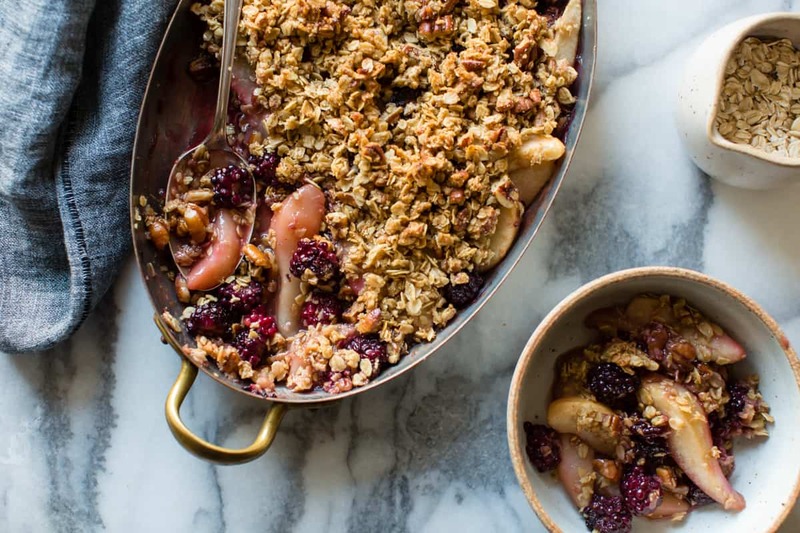 This GF Blackberry, Pear & Ginger Crisp is just right and so satisfying. I’ll be making this frequently. Thanks for posting and I’m looking forward to more wonderful creations. 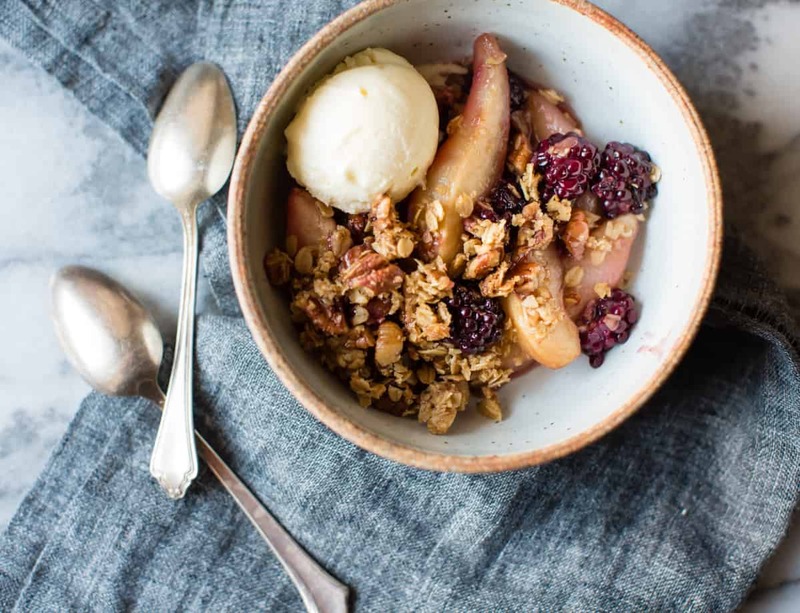 My favorite seasonal dessert is peach and raspberry crisp. Any crisp really but the combination of peaches with raspberries are my favorite. My mother allowed all of us to pick our own birthday menu’s growing up. This was my dessert (I am a summer baby) of choice! Totally, me too! Itching to try Sam’s recipe in her book. Let me know if you give it a go! And awwwww thank you!! I discovered prune cakes and they are divine! Definitely strawberry shortcake! It is just such a nostalgic dessert for me. During strawberry season, my Mum would make it every night which was quite the treat. Either my sister or I would be in charge of making the whipped cream which also meant first dibs on the beaters. Growing up along the border with Maine, she made the biscuits using a baking powder mix called Bakewell Cream that you could only buy in the states. Now I live in Ontario and my sister in the Yukon but we’ve both got cans of Bakewell in our cupboards. My husband is OBSESSED with blackberries…..yet, I never have them on hand for him. Worst wife ever? Yes. Clearly, he will totally forget about my worst wife status when I make this gorgeous crisp! Btw my favorite seasonal dessert is a pandowdy or tarte tatin. Upside-down apple cake made with apples from the Saturday farmer’s market. Best served warm from the oven with a cup of tea. I love Apples the lovely imperfect heirloom ones that are filled with flavors you will never experience from the usual varietals. Any fall dessert made with these delights would make me extremely happy. I don’t bake all that often, but when I do it’s often a crisp or quick bread. Recently, I’ve also fallen back in love with Marie-Hélène’s Apple Cake (which I believe Dorie Greenspan featured in one of her books a few years ago)… I’ve made five of them in the last two weeks. The recipes all sound amazing! Especially this one. Beautiful. I love all the textures. I love baked apples! Cored whole apples with butter, cinnamon, and brown sugar are the best. Add ice cream on top and they are swoon worthy. I’m looking for a good pie crust recipe and a light scone recipe. I’m excited to make the pie crust from Alternative Baker! It’s easy to make a recipe vegan by substituting Earth Balance or oil for butter. It can be trickier to swap for other dairy products. I’m planning to buy a copy of Alternative Baker if I don’t win this contest. I also asked the Oakland Public Library to order a copy. Anything fig this time of year gets me- especially in baked goods! I’ll be making this tonight! I love peach pie/ tart/ ice-cream, essentially peach anything in the summer, especially when the peaches are at their peak ripeness. Saskatoon berry pie! Love to spend hours picking (and eating) the berries from the bushes we have in our backyard. I think they have a different name in America though. My favorite seasonal fruit desserts are: a spring rhubarb sponge pudding, a summer peach tart, an autumn apple pie, and a winter citrus salad. I enjoy apple crisp with an oatmeal, almonds, and coconut topping. I would love to have a gluten free rugalach recipe. I love apple crisp made with the deliciously tart-sweet Jonathan apples. I’m not sure where in the country they’re available- I live in Missouri, and they are everywhere in the fall. However, when I lived in Philadelphia, Jonathans were nowhere to be found! I desperately want a delicious (somewhat easy) gluten free angel food cake recipe. PEARS!!!!!! All pears. All the time. I love them so much. And a recipe I would love to see, which maybe is in your cookbook (I will have to wait for holiday break to check, grad student life leaves little room for baking) is a croissant. I have been craving croissants for 7 years now. I miss them so. My favorite is Concord grape pie with walnut crust but I’ll take a strawberry shortcake in June to tide me over until grape season. My favourite seasonal fruit is durian haha, only got it once but it was amazing! I love bananas, blueberries and pineapple as well! They are great in smoothies! My favourite seasonal fruit is durian! Although I have only had it once before, it was delicious! ! I also love peaches, bananas, blueberries and pineapples, they are great in smoothies! i am so hankering after your cookbook that I’m going for both of these tough Qs :) I absolutely love a good citrus cake (a la your ricotta blood orange cake!) in the wintertime, and can’t get enough of a simple blue or blackberry crisp in the summer. Also, the buckwheat scones from Good to the Grain are fully adaptable to any seasonal fruit – I used plum jam earlier this summer and gingered apple-pear butter this weekend. In terms of goal GF recipes, I would lurv a recipe for a good croissant (or other flakey pastry), a crusty baguette, or challah. a GF girl can dream, right? I would love to find a solid gluten free recipe for big, chewy ballpark style pretzels that you can dip into spicy mustard! This may just be my pregnancy talking, but that would be amazing! Also, I agree with the comment about gluten free croissant. One of my favorite fruit desserts is apple pie, but I haven’t eaten anything in sweet or savory pies that I haven’t liked–love pastry. I also love that I’ve found delicious recipes for gluten-free pastry (just tried your recipe for Teff Flaky Pie Dough in your new cookbook that has made it to our family favorites list). A recipe in gluten-free form that I’ve been searching for is the dumpling dough for Korean mandu. I’ve tried one I found and it was terrible! When huckleberries and pears are in season, I love combining them in a crisp. Crisp is my favorite because leftovers always become breakfast ;). This is gorgeous! First, crisps of any kind are a big favorite. Second, I was browsing Amazon the other day and, loving your blog, checked out your book. I, too, noted the review regarding dairy. My first thought was ‘what does that have to do with anything, you silly person?’ Wish my second thought had been to comment, but I am glad someone else did. 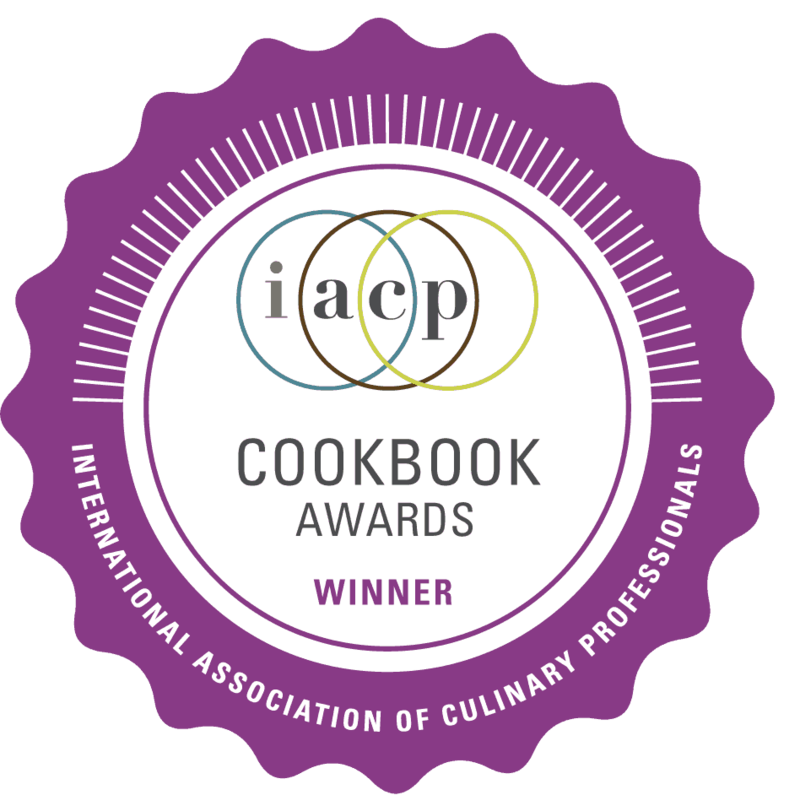 Your book looks great and I am looking forward to cooking with it! 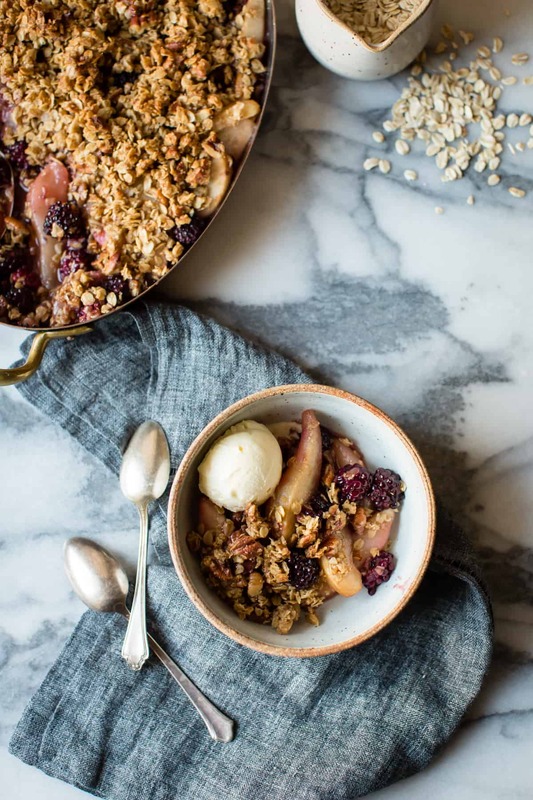 The fruit recipe most often in rotation in my kitchen is your Strawberry Rhubarb Crumble, which I’ve made with almost every fruit imaginable– just today with apples and cranberries! Thank goodness for sane reviews coming to the rescue! I already own both of Sam’s cookbooks and they are incredible. I was just flipping through it last night trying to decide on what to make. I love making a red raspberry and rhubarb galette every spring/early summer that not only looks beautiful, but tastes amazing. I love an apple crumble tart – it’s got the lovely crisp texture, but with a butter-rich crust that makes it easy to cut and take along for lunch! Your book is amazing, thank you. I borrowed it from my local library and together with my daughter we are testing recipe after recipe. We haven’t come across anything we didn’t like. As to my favourite fruit dessert, I would say it would be strawberry “cake/tart”. When I was in high school, every June I would meet with my two best friends and we would bake this strawberry cake/tart. We made bottom crust which resembled shortcake and we would fill cookie sheet with it and on top we would put rows of strawberries. Before we put it in the over, we would sprinkle cinnamon on top. While we waited for it to bake we would make a pot of tea and set the table. The aroma of cinnamon and strawberries would fill the kitchen. We could never wait for it to cool, we would it still warm. For four years of high school we always looked forward to strawberry season. My mom would make a version of this dessert with Italian prune plums, equally delicious. This was absolutely delicious. I upped the amounts to 1 1/2 of the recipe. I had to bake longer. I didn’t have enough blackberries so I threw in some cranberries also as well as chopped candied ginger. It was definitely the favorite of my Thanksgiving party. I was sad to see it go so fast.